Today, I welcome W. D. Foster-Graham to Queering Up Your Bookshelf to talk about drawing inspiration from his father, being a gay teen during the times of Stonewall, and representing often-overlooked African-American gay men in historical fiction. Welcome, W. D. and happy reading! His passion for reading and writing was inspired by his father, who read voraciously. His tastes in writing run to family sagas and M/M romance, seasoned with his own brand of African-American flavor—at the end of the day, it’s all about the love. He shamelessly admits to a love of romance novels, whodunits and classic movies of old Hollywood. He was also inspired by the late novelist E. Lynn Harris, who believed that an author should write the books he/she wants to read. When not in laptop writer’s mode, he loves travel on the open road, nature walks, and time with his husband and son. 1. What is your writing origin story? I couldn’t not write. It was hardwired into me from an early age. My father was a voracious reader, and I inherited that trait from him. It was common for me to go to the library and come home with a stack of books under my chin—and read every one of them. My reading translated into writing short stories as soon as I knew how. The idea for writing my first novel, however, didn’t come until I was in my late thirties. 2. What inspires your writing and how do you keep that inspiration alive? The African-American LGBT authors and poets who went before me are part of it. The other part is much closer to home. My father was my biggest fan and my biggest critic. He always had my back. Rather than complain about a lack of representation, I took a page from him and wrote the books myself. Because all my novels are dedicated to him, as well as my husband and son, the inspiration is kept alive. 3. What does representation mean to you and how does it feature in your writing? As an African-American/Native American gay man who was a teenager at the time of Stonewall, who didn’t see any characters who looked like me in the fictional stories I read in those days, representation is key. In my historical novels, my characters represent the successful African-American men who were often overlooked in novels past unless they were entertainers or sports figures, and LGBT family members are featured in them. 4. What are some of your favorite tropes (or ways to subvert them)? In the world of m/m romance, my favorite trope would be friends-to-lovers. A close second is having a main character who realizes he’s not as “straight” as he thought he was. Once I have the idea down, I create psychological profiles of my characters. Taking a page from Agatha Christie, I write the beginning and the ending of my novel first. My outline is brief and topical. From there, I write it the same way a movie is shot—out of sequence. It all comes together in the end. 6. What is your best piece of writing advice? 7. What is the hardest lesson you learned while writing? It happened when writing my first novel. It was to ignore the naysayers. I got over them and published the novel anyway. “Believe in dreams and never give up” is my motto, no matter how long it takes. 8. What do you hope readers will take away from your work? 9. What is a great queer book you’ve read recently? There were two: Play It Forward by Frederick Smith, and Visible Lives, an anthology paying tribute to E. Lynn Harris by Terrance Dean, James Earl Hardy and Stanley Bennett Clay. 10. What are you currently working on? What’s next for you? I am currently writing two m/m romance novels. One is The Right to Be; the other is To Thine Own Self. My whodunit, Never Give Up, is ready for the next phase of publication. Since my novels are all part of a family saga/series, it’s best to read them in sequence. With the size of this extended African-American family, there’s plenty of room for more m/m romance in the future. Allan Beckley Christopher is a self-made, African-American multimillionaire. Starting out with nothing but family, high intelligence, ambition and drive, he succeeded against the odds. He dealt with racism, discrimination and the naysayers, Black and white, who were convinced he would never make it as an entrepreneur in the 1960s. Opening a fix-it shop in southside Chicago, through hard work and determination he turns it into a multi-million-dollar corporation. He’s “made his mark.” His home is a thirty-room estate. He is among the Who’s Who of Black America. His company is listed in the Fortune 500. He is a “mover and shaker” in the community, and all the connections that accompany it. He faithfully attends church on Sundays. But has he made it? With the advent of his sixtieth birthday, his character, his past and his beliefs come into focus, honor and question as his story is told through the eyes of his family—including his four LGBT children-- and with it his impact on their lives. The time is 1988; the place, Chicago. 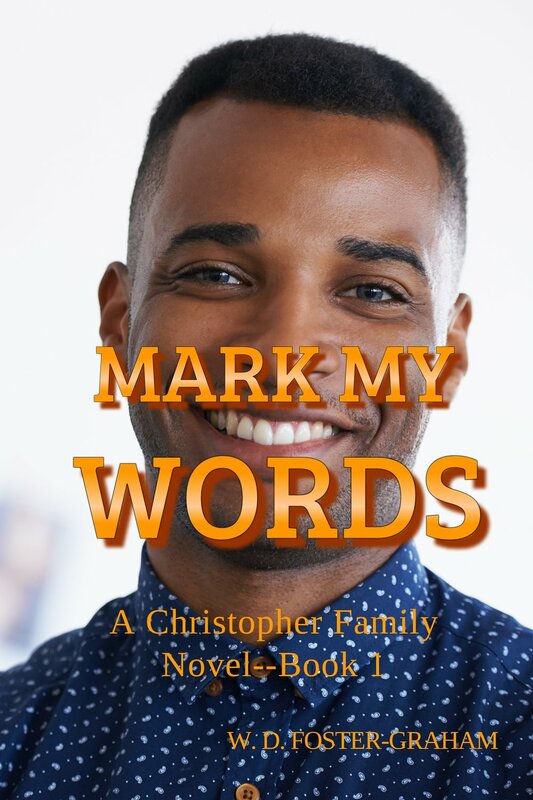 Note: Mark My Words: A Christopher Family Novel is a 3-book series.